"The Wrath of the Lamb"
On Hannibal Season 3 Episode 13, Will may have to face his darkest fears as he uses Hannibal to hatch a plot to slay Francis Dolarhyde in the series finale. "The Number of the Beast is 666"
On Hannibal Season 3 Episode 12, the FBI enlists the help of Freddie Lounds and Dr Chilton to catch the Red Dragon, while Will's empathy affects his judgement. "...And the Beast From the Sea"
On Hannibal Season 3 Episode 11, as the full moon gets closer, Will, Jack and Alana realize that Hannibal knows the Red Dragon and has spoken to him. "And the Woman Clothed in the Sun"
On Hannibal Season 3 Episode 10, Dolarhyde and Will seek the wisdom of Hannibal Lecter while carvings symbolizing the Great Red Dragon are found at crime scenes. "And the Woman Clothed With the Sun..."
Will comes face to face Hannibal once more when he requires his help in order to get into Dolarhyde's mind to figure out his next move on Hannibal. On Hannibal Season 3 Episode 8, a new villain emerges in Francis Dolarhyde three years after Hannibal's arrest, and Will is asked to help. On Hannibal Season 3 Episode 7, Will and Hannibal are captured by Mason Verger, and Margot and Alana navigate these new circumstances. On Hannibal Season 3 Episode 6, Hannibal and Bedelia reacts to the new circumstances, while Will and Jack reunite and renew their alliance. On Hannibal Season 3 Episode 5, the hunt for Hannibal Lecter heats up as Will travels to Italy, and Mason Verger and Pazzi each find leads. On Hannibal Season 3 Episode 4, Jack urges Will to drop his hunt while Dr. Chilton returns, determined to continue the search for Hannibal Lecter. Will: Is Hannibal IN LOVE with me?!? Bedelia: Could he daily feel a stab of hunger for you, and find nourishment at the very sight of you? Yes. But do you ache for him? Permalink: Is Hannibal IN LOVE with me?!? Graham: What are you smiling at? Lecter: Peaking behind the curtain, I'm just curious how the FBI goes about its business when it's not kicking in doors. 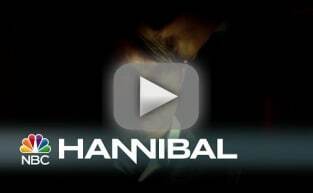 Hannibal Season 3: First Look!